There are several display modes available for this list. The default mode is called "detailed list", it shows such details as cover, title, year, genre, artist. Additionally, your own rating can be displayed. Under the list, there is a small toolbar with two buttons that allow switching between two different display modes. From the "detailed list" mode, we can switch to the "cover list" mode. 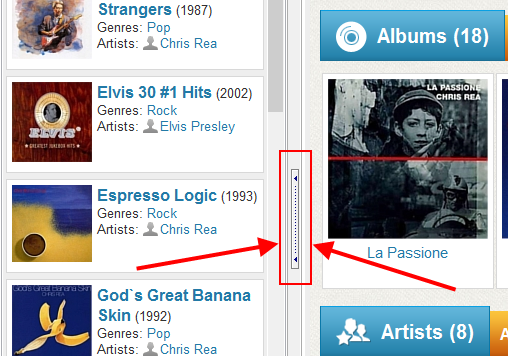 In the "Cover dimensions" fields, we can adjust the size of covers in the cover list mode. 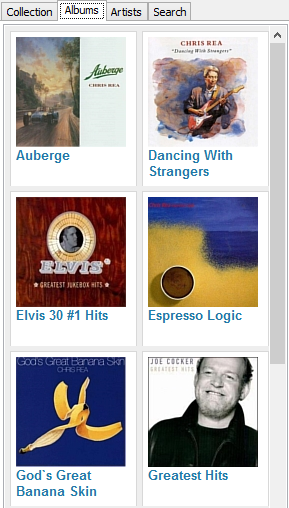 In the interface settings window, there are several more options that can change our album list. They apply to the detailed list mode. "Cover / photo width in the list" allows making covers and photos of artists bigger or smaller. Disabling the "Show covers in the album list" option will hide all covers in the "detailed list" mode. 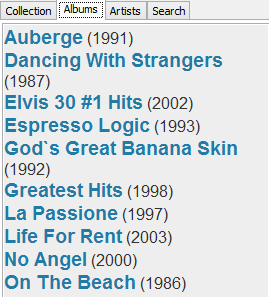 Enabling "Show only titles and years in the list" will hide information such as artist, genre, etc. You can double click the border to hide the list altogether. The border moves to the left, you can later drag it back to its position, or double click it again to restore its previous position.